This might sound harsh, but even if the cow was one of a very lucky few who walked up Temple Grandin’s purportedly humane “stairway to heaven”, their lives are still filled with misery and untold pain and suffering before they’re unnecessarily killed for food. Cows communicate by staring and it’s likely we don’t understand their very subtle ways of communicating. They also form close and enduring relationships with family members and friends and don’t like to have their families and social networks disrupted. What’s a hamburger? To put it bluntly, this iconic ground-beef-patty sandwich that is revered in America and around the world is nothing more than a dead cow on a bun. We can serve it grilled, barbecued, square, round, filled with holes or other ingredients such as flour, vegetable protein, or ammonia treated defatted beef trimmings (really!) or topped with assorted items including ketchup, mustard, mayonnaise or seasonings that enhance or mask its taste rendering the burger palatable. However, we can’t change the fact that behind the innocent looking burger (that people don’t blink an eye before sinking their teeth into), lies the story of the life and death of a cow who experienced more pain than pleasure during her journey from birth to her grave in a bun. The plate on which this unnecessary meal is sitting is nothing more than a platter of pain, a graveyard. The cows that end up on burger buns were all sentient mammals who not only felt pleasure and pain, but were also very intelligent. Cows worry over what they don’t understand and have been shown to experience “eureka” moments when they solve a puzzle such as how to open a particularly difficult gate. Cows communicate by staring and it’s likely we don’t understand their very subtle ways of communicating. They also form close and enduring relationships with family members and friends and don’t like to have their families and social networks disrupted, nor do they like to be subjected to the reprehensible conditions to which they are exposed during their transport to the factory farm (or CAFOs, concentrated animal feeding operations) and their short stay at these filthy and inhumane facilities. They also suffer not only their pains but the pains of other cows who are their short-term roommates on the way to one’s plate. 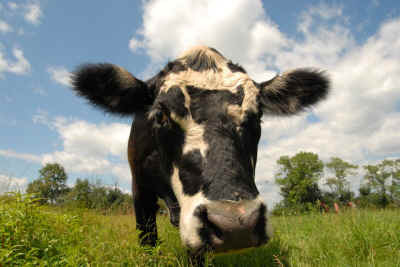 Because cows are sentient one should really ask, “Who’s for dinner?” not “What’s for dinner?” if an animal is involved. Who we eat is a serious moral question. Cows also carry numerous diseases they acquire while being prepared to become a burger, many of which are easily passed on to humans (for a summary of scientific research see the work of renowned physician, Michael Greger. Confinement at high densities at agribusiness factory farms require that cows be given antibiotics and hormones during their transformation from cows into burgers, and pesticides are also freely used. It’s known that slaughterhouse workers may develop acute and chronic lung disease, musculoskeletal injuries, and may catch zoonotic infections (ones that transmit from animals to human beings and vice versa). Consumers also can suffer from the chemicals to which cows are subjected to control the spread of disease on filthy factory farms. Mad cow disease that causes variant Creutzfeldt-Jakob Disease (vCJD), a fatal dementia, also is a major problem as is swine flu, so a burger can really turn out to be very dangerous to one’s health. Let’s also not forget recent E. coli outbreaks and the numerous recalls of hundreds of tons of cow meat that had been infected with feces. Millions of Americans are infected and thousands die each year from contaminated animal “food” products. For more on why one can safely say “eat a cow at your own risk” read CAFO: The Tragedy of Industrial Animal Factories. Even if you don’t care about the ethics of eating a cow because you consider it sentimental or dismiss the possibility of getting seriously ill, consider the environmental impacts of factory farms and what non-animal activists are saying about the well-documented and deleterious effects that CAFOs are having on the land in surrounding communities, water, the air we breathe, and climate change. Even the United Nations has issued a concern about the environmental impacts of factory farming that are direct effects of rampant and unnecessary animal cruelty. It’s been estimated that factory farms generate a fifth of the world’s greenhouse gases, more than transportation. One-half of New Zealand’s greenhouse gases come from animals on factory farms. Animals are living smokestacks, emitting methane and nitrous oxide. The use of water and land for the production for unneeded meat is huge compared to the amount of land and water needed to produce non-animal meals. With some 90% of managed water going for food production, and the forecast that by 2025 about 64% of humanity will be living in areas of water shortage, Commercial meat production is not sustainable. Clearly, the numerous and serious problems associated with eating burgers isn’t a matter with which only organizations such as People for the Ethical Treatment of Animals is concerned, or some radical point of view. The scientific facts speak for themselves. The benefits of making humane and ethical choices are evidence-based, supported by impartial and solid research. So, what can we do? Each of us can make more ethical, compassionate, healthier, and environmentally friendly choices. No one has to eat a burger (not one made of animal meat at least). Excuses such as “Oh, I know they suffer, but don’t show me because I love my burger,” adds cruelty to the world because you’re eating animals who do really care about what happens to them and to their friends. Indeed, as one of my friends who works “in the industry” has told me time and again, when you’re eating meat and other animal products, you’re eating misery. And, most likely, you’re also eating filth and disease. By replacing mindless eating with mindful compassionate eating we can easily expand our compassion footprint, an idea I developed in my book The Animal Manifesto: Six Reasons For Expanding Our Compassion Footprint. By removing animals and animal products from our diets each of us can really make a positive difference that will benefit ourselves and future generations, our children and theirs, who depend on our goodwill, as they will inherit whatever we leave in our wake. Marc Bekoff is a former professor of Ecology and Evolutionary Biology at the University of Colorado, a Fellow of the Animal Behavior Society, and a former Guggenheim Fellow. In 2000 Marc and Jane Goodall co‐founded Ethologists for the Ethical Treatment of Animals and in 2009 Marc was presented with the Saint Francis of Assisi Award by the New Zealand SPCA. Marc has published numerous scientific and popular essays and twenty‐two books including The Emotional Lives of Animals, Animals Matter, Wild Justice: The Moral Lives of Animals, The Animal Manifesto: Six Reasons for Expanding Our Compassion Footprint, and the Encyclopedia of Animal Rights and Animal Welfare. His websites are marcbekoff.com and, with Jane Goodall, Ethologicalethics.org.